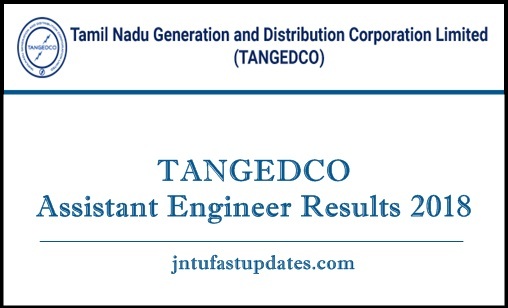 TNEB TANGEDCO AE Results 2018: Tamil Nadu Generation and Distribution Corporation (TANGEDCO) has conducted the written test on 30th December for Assistant Engineer (Electrical, Computer Science Electronics & Communication, and Civil Engineering) posts. A large number of aspirants those who have applied for the AE posts in TANGEDCO have competed for the written test round to prove their ability and skills. The TANGEDCO has organized the examination in many examination centers across the state of Tamil Nadu. All the competitors who have clashed for the examination can check the TANGEDCO AE Answer key 2018 from the official website, tangedco.gov.in. It is presently accessible on the TANGEDCO portal. Aspirants waiting for the update regarding TANGEDCO AE Result 2018 can wait for few more days. The organization will soon announce the result date on its official portal. Along with the result declaration, the cutoff marks, and merit list will also be made accessible by the TANGEDCO. Tamil Nadu Generation and Distribution Corporation (TANGEDCO) has recently notified 300 Assistant Engineer (Electrical, Computer Science Electronics & Communication, and Civil Engineering) posts. Many of the aspirants having the suitable eligibility criteria have applied for TANGEDCO AE posts. The application process was continued from 14th February to 28th February 2018. This year a large number of aspirants have applied for the AE posts in TANGEDCO. The selection process will be done through written test and interview rounds. Candidates clearing the selection rounds will be finally shortlisted for the AE posts. Name of the Recruitment Board Tamil Nadu Generation and Distribution Corporation (TANGEDCO). Name of the Posts Assistant Engineer (Electrical, Computer Science, Electronics & Communication, and Civil Engineering). Total Number of Vacancies 325 Posts. Selection Process Written Exam, Certificates Verification. All the competitors clashed for the TANGEDCO AE written test have to wait for few more days to download the result. The organization usually announces the result within 3 to 4 weeks after the examination date. Hence the competitors can stay patient until the TANGEDCO announces the result date. Candidates can keep checking the TANGEDCO portal, tangedco.gov.in for latest updates. The competitors need to get the minimum cutoff marks/qualifying marks to clear the exam. The cutoff marks/qualifying marks will be decided by the organization based on various facts such as the number of announced posts, the number of competitors clashed for the examination and various other factors. Candidates can check TANGEDCO Assistant Engineer Cutoff Marks category-wise, section-wise and overall at the time of declaration. Candidates have to score the qualifying marks as specified by the TANGEDCO. Search for ‘TNEB Assistant Engineer Result 2018’ Link on the homepage. Any one know, when result as came?? Result official page la varatum…athukulla ethuku rumours kelapiringa…. தேடலே வாழ்க்கை தேடி கிடைக்கவில்லையே உண்மையே உன் நிலை என்ன? In this page TNEB_AE expected result is mentioned as 1st week of February 2019. Could you please share us from which source you have got the information? Today AE Results are Published or not…Pls Post on official information ..Becoz lot of engineers waiting for that information ..
Do you know, When we can expect tangedco AE result to be published.please let us know….